How to get from La Fortuna and Arenal Volcano to Río Celeste? Enjoy one of the best nature hikes—rich in biodiversity—in northern Costa Rica as well as one of the most beautiful and impressive waterfalls in Costa Rica. We provide transportation services to and from La Fortuna – Arenal Volcano area and Tenorio Volcano National Park and the Río Celeste Waterfall. Travel comfortable to enjoy one of the most beautiful places of Costa Rica. The best way to do the Rio Celeste hike by your own. We offer you transportation back and forth from La Fortuna and Arenal Volcano to Tenorio Volcano National Park and Río Celeste Waterfall . ﻿Enjoy one of the best hikes to enjoy Nature on the North area of Costa Rica. Pick Up: We pick you up at your hotel in La Fortuna, we just need the name of the hotel to let you know the exact pick up time. Time back: 3:30pm to La Fortuna. Transportation ( the round trip) in a comfortable minibus with air conditioner. Daily Shuttle from La Fortuna or Arenal Volcano area Hotels to Río Celeste. Please fill out the form if you want to make reservation or if you need any extra information about the round trip transportation to Rio Celeste. The Rio Celeste Waterfall Hike is classified as being of moderate difficulty. It has duration of approximately 5 hours; trails are well marked so it is easy to do as a self-guided adventure. The always green forest is made up of both montane rainforest and cloud forest; palms, heliconias, ferns, orchids and bromeliads dominate the forest floor. You’ll also find a rich diversity of trees that provide nutrition for the endangered tapirs that live in the National Park. Río Celeste, or Celeste River in English, is named such for its peculiar turquoise color that makes the river one of the principal tourist attractions not only in the National Park, but in Costa Rica as a whole. · A location known as Los Teñideros which roughly translates into English (there is no exact equivalent for it in the language) to ‘where the water dyes or changes color’. · Nearby you can visit another location known as Los Hervideros or Borbollones. This is a site with natural hot springs where the water can reach between 31 and 94 degrees Celsius (88 to 201 degrees Fahrenheit). · During its descent from the Tenorio Volcano the water forms a lagoon called Laguna Azul or Blue Lagoon. This is where you can best appreciate the intense celestial blue color of the water. 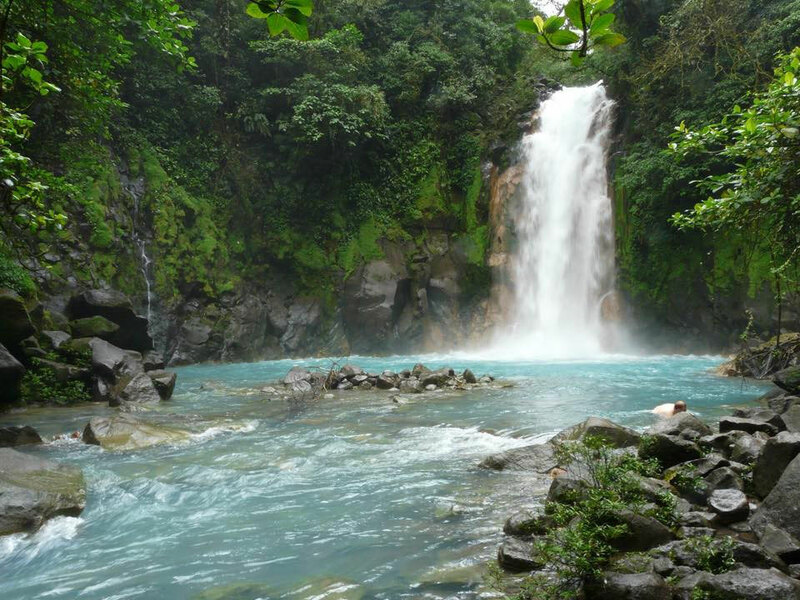 · After the Lagoon the course of the river continues descending to form the Río Celeste Waterfall. · A paradise for bird lovers! Over half of all the bird species in Costa Rica call Tenorio National Park/Río Celeste home.